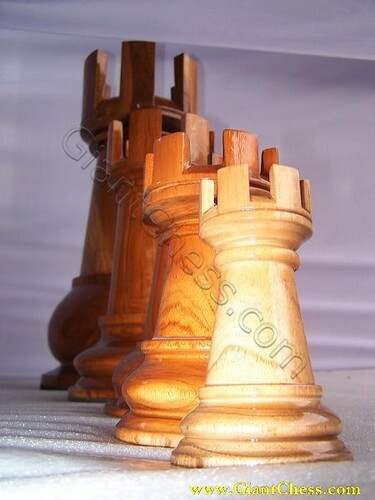 As chess pieces manufacturer, we have variety chess type in sizes. All of our products are made of the best quality of Teak wood and carved by professional craftsman. We choose the Teak wood from the best and has dried, so that our products are very durable for use outdoor and indoor. You do not need worry about product damage because we had consider it when we process the product and produce it carefully in order to make it strong in any seasons and weather. In the picture you can look one of our product named Rook Chess Pieces. We have this Rook pieces in variety sizes, from the little Rook until the giant Rook. Sure that those are made of Teak wood and polished well. In the picture above, we give you an example of Rook in sizes and polished in brown or natural wood. If you want to other chess pieces, we provide it or may be you want to another color, we will accept your order.